Jordan script support thumbnail, I guess that is a Max 2010 or .NET (or both) feature. most important of them in this case is the Drag-N-Drop options. The script is open source so you can see the trick inside. 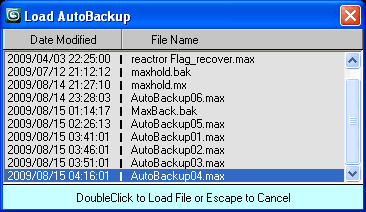 never more than one file there, also the last is deleted when the dialog closes. in next Max sessions and even after a restart Windows. So, all you need to do is to set thumbnails view mod once (on first start)*. [*] For more details see the video. and it's still compatible with 3ds Max 9 and higher. Submitted by fajar on Mon, 2009-08-17 06:26. @Anubis: it's cool, Good job you've done. Thank! Submitted by Anubis on Mon, 2009-08-17 02:24. I'll keep the previous version 1 for those who don't need this innovation.